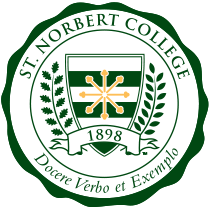 For only the eighth time in its 119-year history, St. Norbert College welcomes a new president. President Brian J. Bruess ’90 assumed the role July 1 upon the retirement of President Emeritus Tom Kunkel. The transition anticipates a busy week in October, when Bruess will be formally installed at the Oct. 11 inauguration ceremony. The date falls in the middle of what promises to be a lively week on campus, with a warm welcome assured for all at Heritage Week, alumni and Homecoming events, and, of course, on Inauguration Day itself. 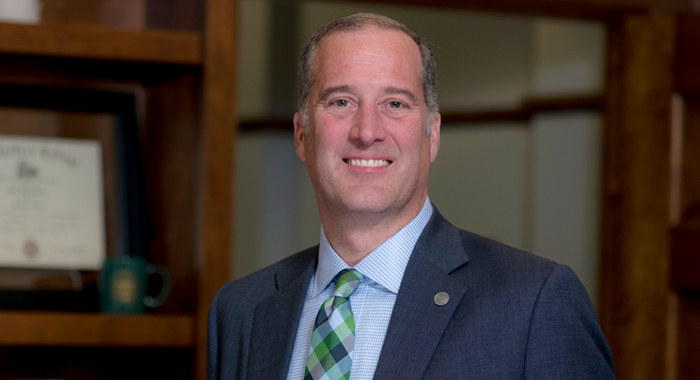 Bruess is the second alumnus to hold the college’s highest office, and only the eighth person to lead St. Norbert College. For the first 57 years of the college’s history, it was led by its dynamic founder, Abbot Bernard Pennings, O.Praem., who assumed the role as a young man and served long in the office. He was succeeded by the first alumnus president, the Rev. Dennis Burke, O.Praem., ’26. Brian Bruess comes to St. Norbert from St. Catherine University in St. Paul, Minn., where he was executive vice president and chief operating officer. During his 21-year career at St. Kate’s, Bruess has led areas encompassing enrollment management, student affairs, information technology, athletics, finance and administration. His focus on student learning resulted in strong student retention and increased diversity. He was also instrumental in attaining and sustaining St. Kate’s financial strength. Carol also has a background in higher education, serving on the faculty of St. Thomas University in St. Paul as professor of communication and journalism, and as director of the family studies program. The Bruesses have two children. Gracie, a senior this coming year in high school, is working as a lifeguard in St. Paul, training for her fall swim season. Tony, a senior this coming year at Stanford University, is spending his summer interning in New York City for AngelList, a company that supports startups, a passion near and dear to his heart and talents. Learn more about the Bruesses in Brian’s first Letter From the President in the Summer 2017 issue of St. Norbert College Magazine.